Aimersoft DRM Media Converter is capable of stripping DRM protection WMV, M4V, WMA, M4P, M4B, AA and more files downloaded or purchased from iTunes, Amazon, Or any online store, And with easy steps you can convert them to virtually any regular video/audio formats for play on portable media players like iPhone, iPad,iPod, HTC, Samsung and BlackBerry. and with Aimersoft DRM Media Converter you can Batch Conversion files with the multi-threaded conversion will allow you to convert multiple files at a time. Aimersoft DRM Media Converter has a clean and simple interface and intuitive. Media files can be imported into the list by using either “drag and drop” or file browser method, Also this apps allows the batch processing . With Aimersoft DRM Media Converter settings menu you will have reasonable set of configuration options so that you can tweak how Aimersoft DRM Media deals with your audio files. Aimersoft DRM Media is easy to install and use with a very handy. And there are two ways to import files into the program, (1) Click the Add button at the top left to browse your computer’s folders and select the file(s) you want or (2) just drag-and-drop the files you want directly from your desktop into the main window and remember, you can import multiple files at once thanks to batch conversion. HD Video: MTS, TS, M2TS, TP, TRP, TOD, HD MKV, HD WMV, HD MOD, HD MOV, HD FLV. If you have specific needs concerning video or audio quality, click the Settings button at the bottom (there are separate buttons for audio and video) to select the output format you want, then, you can set the video parameters (resolution, frame rate, encoder, and bit rate) or audio parameters (such as sample rate, channel, encoder and bit rate). 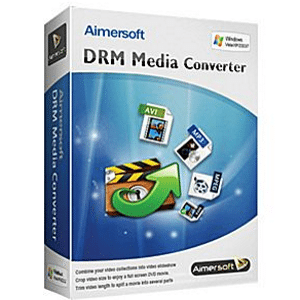 Aimersoft DRM Media Converter simplicity makes it a joy to use and it does an excellent job of converting different audio formats, including DRM protected music . the coverting rate speed was the best in class, Aimersoft DRM Media Converter will save you a lot of time and is worth considering.